Contract Engine is designed for professionals – this complete system for managing all your client engagement letters allows you to create work schedules (to cover exactly the scope of what you’ve agreed to do for the client) in seconds. And each contract includes your firm’s name and address details as well as properly identifying the client. The document (in PDF format) can then be saved locally on your computer, in the Contract Engine Management System or emailed directly to your client. In today’s business climate, anything less than a full and comprehensive set of Terms and Conditions of Business is professional suicide. Avoid expensive and embarrassing professional negligence claims with Contract Engine. 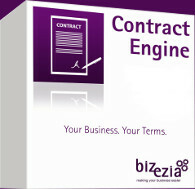 Contract Engine provides a comprehensive list of terms to consider when creating an Engagement letter. Eliminate uncertainty with your clients, and make it very easy to agree terms. Contract Engine includes 150+ engagement/client care letter templates for accountants and 200+ for lawyers. The templates are fully-editable to cover exactly what you’ve agreed to do for your client. We’re very sure that you’ll gain real value from Contract Engine. That’s why we have the confidence to guarantee it. We’re so sure you’ll benefit from Contract Engine that we’re offering a 30 Day Money-Back Guarantee. If, within 30 days of the start of your subscription, you tell us that Contract Engine hasn’t resulted in you getting more fees and clarifying the work you’ve done for your clients, we’ll refund your full subscription with no questions asked. No other engagement letter system gives you that guarantee.